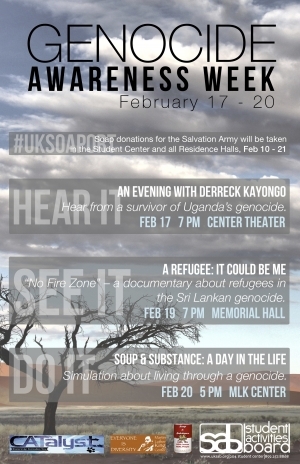 LEXINGTON, Ky (Feb. 17, 2014) — Genocide Awareness Week at the University of Kentucky will begin with Derreck Kayongo, a refugee of the Ugandan civil war. Kayongo will share his experiences as a refugee and how he turned his struggles into an opportunity. He will point out how small contributions can save thousand of lives. Kayongo will speak at 7 p.m. Monday, Feb. 17, in the Student Center's Center Theater. This event is free and open to the public and is sponsored by the Student Activities Board's Multicultural Affairs Committee. After many years of witnessing devastation in his homeland, Kayongo is now a philanthropist and the founder of the Global Soap Project. Used hotel soaps are collected, cleansed, reprocessed and shipped to nations like Haiti, Uganda, Kenya and Swaziland. The idea began in the early 1990s after Kayongo first arrived in the U.S. and stayed at a hotel in Philadelphia that replenished the bars of soap daily. The project focuses on improving living conditions for people in impoverished countries. Continuing Genocide Awareness Week, SAB will screen "No Fire Zone" at 7 p.m. Wednesday, Feb. 19, in Memorial Hall. This film provides inside information on the lives of refugees who have survived genocide and their struggle to rebuild. The screening will be followed by a question and answer session with Mark Whitaker, professor of anthropology at UK. SAB, CATalyst and the Martin Luther King Center will also host an event that allows students to experience the everyday struggles of refugees from 5-7 p.m. Thursday, Feb. 20, in the MLK Center. Students will live the life of a refugee without basic sanitation, such as no soap and water. They will have the opportunity to facilitate stimulating conversation on the issue. The Student Activities Board brings more than 100 entertaining, educational and enriching programs that reflect on contemporary issues to the University of Kentucky campus each year. The programs are designed to enhance the college experience for students, faculty, staff and the greater Lexington community. Connect with SAB at www.uksab.org, follow them on Twitter at twitter.com/UKSAB or like them on Facebook at www.facebook.com/UKSAB. For more information about SAB and events, emailcontact@uksab.org or text a question beginning with SABQ, followed by your question or comment, to 411-247.